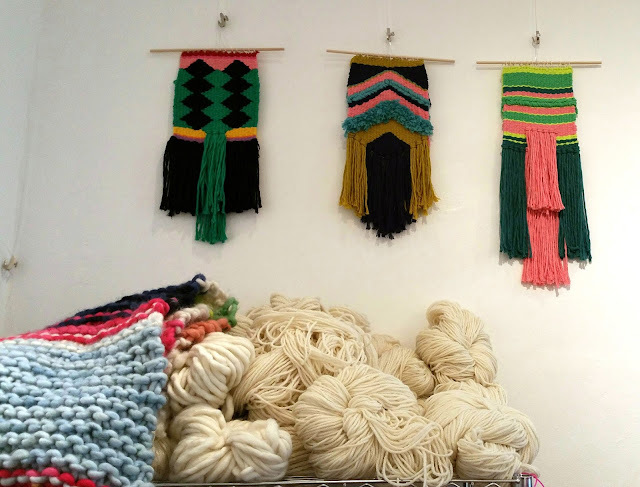 A few weeks ago I attended a Tapestry Weaving workshop run by Textile Artist, Natalie Miller. Natalie is based in the Southern Highlands but was in Sydney running a series of workshops at the Thread + Colour exhibition that took place in April. 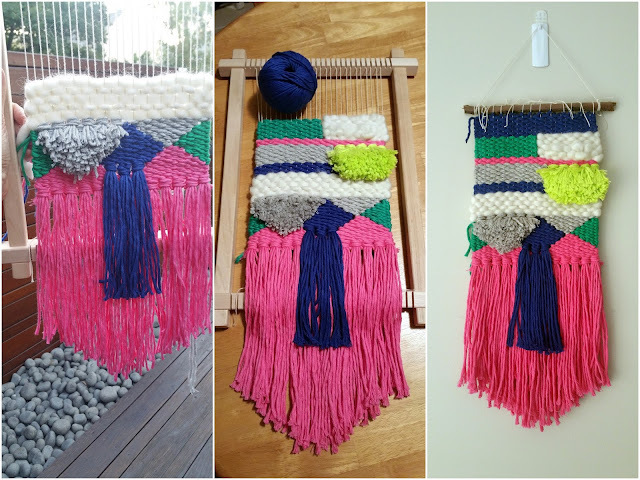 The workshops were fairly cheap at $125 and you came home with your own loom and some wool so I jumped right on in. I'm not sure why I wanted to embark on this/another craft, but I like dabbling in the hopes that a few, easy to do at home, crafty pursuits will stick. Unlike sewing, where precision is necessary - and then there's always fitting issues, weaving feels really...free! 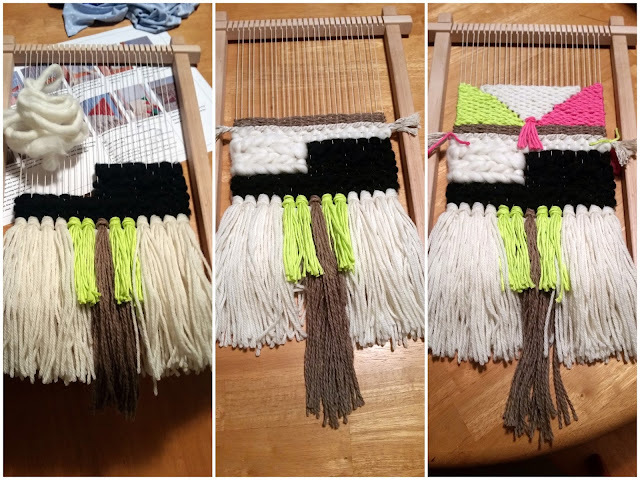 There are obviously right and wrong ways to do things but it also feels wildly creative -- I embarked on my weaving in the class with no real plan, other than an idea of what colours I'd like to use. We learnt the basic techniques in class which was enough to make a good start on a project and finish it off at home alone. 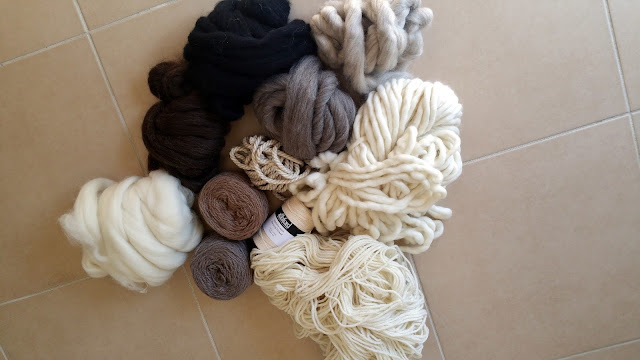 I love how you can create different textures with the yarn and I especially love the thick wool called "roving" - it creates such a nice texture (and smells of lanolin which is lovely). 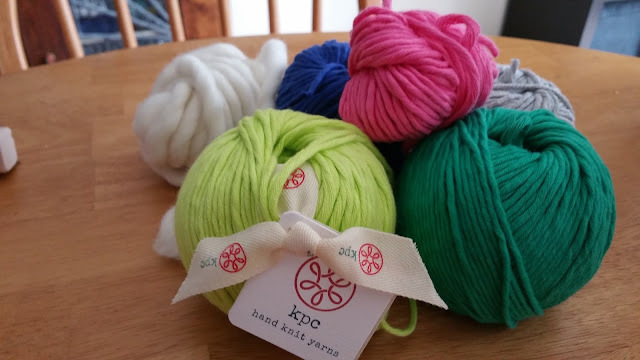 As with any hobby part of the fun is shopping so after I finished my first project I ordered some wool online from Natalie Miller and shortly after a "neutrals" pack turned up that allowed me to dive into my second project. There is A LOT of un-spun roving in this pack which is different to the roving we used in class (that was spun somewhat I guess) but I figured out you just pull it apart and go from there. For my second project I used wool from the new pack and wool left over from class. Pretty happy with the result.I tried a new stitch called "Soumak stitch"...didn't work out quite right, but I'm not sure it matters too much. 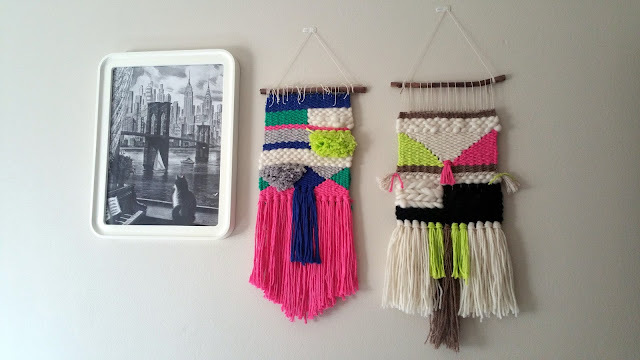 Both weavings now have pride-of-place in the bedroom - I'm planning to pad all the vacant wall space in our flat with weavings! My office-buddy has suggested I make a hanging for our office...challenge accepted! 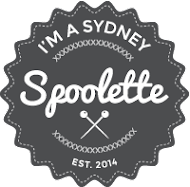 I'm really happy with the finished result of both of my projects -- but there is one stitch I couldn't quite get (damn you Soumak stitch) so I'm off to do another class with Natalie in Moss Vale in June. Cannot wait!